Your clients should have these three important legal documents. A health-care proxy's purpose is to give someone the power to make medical decisions for your client. Also known as a durable power of attorney, this document must be drawn up and signed while the senior is still mentally able to make decisions. The document gives the decision-making power to just one person - usually a family member. 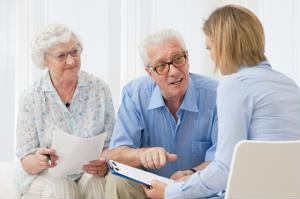 An advanced health care directive, also called a living will, legally states the senior's end of life medical wishes. Some of the most common specifications in an advanced care directive include the senior's wishes for resuscitation, life support and other medical procedures that could prolong his or her life. Everyone should have a will drawn up in case an emergency occurs. A senior's will gives specific directions for who should receive any finances or other property in the event of his or her death.